Thank you to Brian Paco Alvarez for sending us this information! As you can see, it’s based on one of Jack’s favorite obsessions, decorative block. There’s lots more of them on our old blog. Please join us for the dedication of Ornamental, a public artwork by Catherine Borg on Wednesday, April 9th. 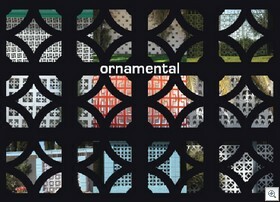 Ornamental is a project by the City of Las Vegas Arts Commission percent for the arts program. The patterns incorporated in ornamental are based on photographs by the artist documenting brick walls in older Las Vegas neighborhoods. Reduced from the photographic to essential patterns and presented on a mirrored material, the intent of this project is to suggest connection among all downtown dwellers, old and new. Wednesday, April 9, 2008 at 5:30 p.m. Reception immediately following in the lobby of the Soho Lofts, 900 Las Vegas Blvd. South. ornamental is a 120′ long public artwork commissioned in association with the Hoover Street Improvement Project. Special thanks to Sam Cherry for his support of the project. ornamental is a project by the City of Las Vegas Arts Commission. For more information, visit our website: www.lvartscommission.com or call (702) 229-6844.